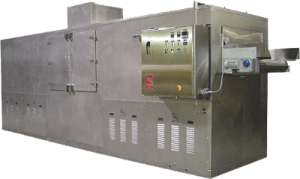 Benefits: High capacity blowers to reduce moisture in either bake or fry type extruded products below 2%. Efficient fully modulating heaters with all required safeties. 5″ insulation throughout oven walls. Air flow is tuned to provide even heat distribution. Fully wired panel to control belt speed, air velocity, burner and safeties. Large access doors with explosion relief latches, crumb pans below belt with easy access for cleaning. Complete manuals with wiring diagrams. No limit to size or capacity of ovens. Dryers built to suit customer specifications. All heating types (i.e. electric, No. 2 oil, LPG, Natural Gas, Steam etc.) available. Construction: All stainless steel exterior with stainless steel food contact points or painted steel exterior with stainless steel food contact points. Belting can be of stainless or high carbon steel wire mesh weave. 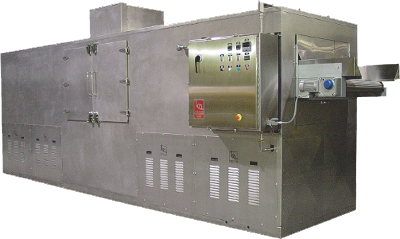 Single, double or 3-pass dryer models available.